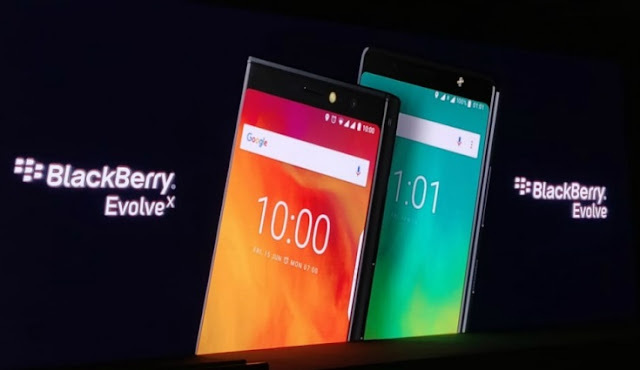 The BlackBerry Evolve X and Evolve have been launched in India at an event held in the capital on Thursday. Both smartphones will be sold in the country by licensee brand Optiemus Infracom. The company announced that the two handsets have been conceptualized, designed, and manufactured in India. The Evolve and Evolve X feature Corning's Gorilla Glass 5, Series 7000 aluminium frame, and a BlackBerry textured and rubberized back panel. BlackBerry Evolve X and Evolve price in India, availability, specifications, and features have been revealed at the event. Let's have a look. Launch offers include a 5 percent cashback with ICICI Bank credit cards (only on no cost EMI plans). Other than that, no cost EMI options are available from all leading banks. Benefits worth Rs. 3,950 are available for Jio SIM card users. The BlackBerry Evolve X and Evolve both run Android 8.1 Oreo out-of-the-box, and sport a 5.99-inch full-HD+ (1080x2160 pixels) FullView IPS LCD display with an 18:9 aspect ratio, a max brightness of 500 nits, and oleophobic coating. The BlackBerry Evolve X is powered by the 64-bit octa-core Qualcomm Snapdragon 660 SoC, coupled with an Adreno 512 GPU and 6GB of RAM. Onboard storage is capped at 64GB, expandable via microSD card (up to 2TB). On the other hand, the BlackBerry Evolve is powered by a Qualcomm Snapdragon 450 SoC, paired with an Adreno 506 GPU and 4GB of RAM. Internal storage on the Evolve is capped at 64GB, with expandable support via microSD card. In terms of camera specifications, the Evolve X sports a dual rear camera setup with a 12-megapixel primary sensor (f/1.8 aperture, 1.4-micron pixels) and a 13-megapixel secondary sensor (f/2.6 aperture, 1.0-micron pixels) with a 6P lens and dual tone LED flash. 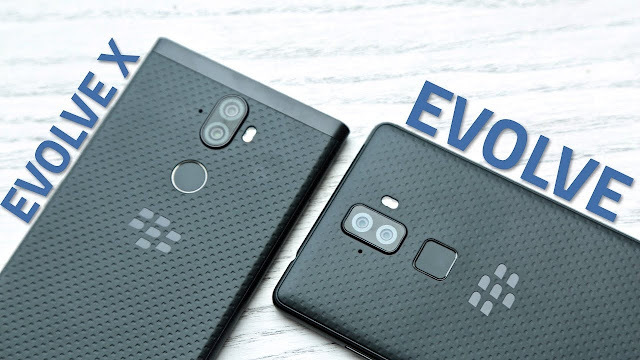 The BlackBerry Evolve has a dual rear camera setup with two 13-megapixel sensors that come with f/2.0 aperture, RGB+Mono mode, and dual tone LED flash. Both phones share camera features including refocus mode, 4X autofocus, and slow motion video. On the front, both of them bear a 16-megapixel fixed focus sensor with f/2.0 aperture, 78-degree FoV, Tetra Pixel technology, real-time bokeh mode, and LED flash. There is a 4,000mAh battery under the hood, once again, for both. There is support for wireless charging only on the Evolve X, and a wireless charger will be sold separately for it. Both the smartphones have a rear-mounted fingerprint sensor with a claimed unlock time of 0.3 seconds, and are also the first smartphones from the BlackBerry brand to have Face Unlock capabilities with a claimed unlock time of 0.4 seconds. Connectivity options include 4G VoLTE, FM radio, USB Type-C with OTG, and a 3.5mm headphone jack. The two new BlackBerry smartphones come with the BlackBerry Power Centre app that uses deep learning to analyse your usage and optimize battery settings. It also lets you modify RAM allocation for each app, and create custom battery profiles. Both handsets feature built-in Dolby audio, however the Evolve X supports an evolved Dolby Atmos technology. The new BlackBerry Hub brings together all communication apps such as Facebook and Twitter into a single app to help you navigate through your social media accounts. Security features include the BlackBerry Password Keeper app that helps secure your passwords in a vault and also helps in creating new secure passwords. The BlackBerry Privacy Shade feature helps reduce visible screen size to the area which you are accessing. Root protection is also available with OS hardening.